E-64 is a natural, potent, and irreversible inhibitor of cysteine proteases.Its IC50 values for inhibiting cathepsins K, S, and L, in vitro, are 1.4, 4.1, and 2.5 nM, respectively. The solubility of this compound in DMSO is ≥53.6mg/mL. General tips for obtaining a higher concentration: Please warm the tube at 37 °C for 10 minutes and/or shake it in the ultrasonic bath for a while.Stock solution can be stored below -20°C for several months. E-64 inhibited H-59 invasion in a dose-dependent manner with a maximal inhibition of 97% at a concentration of 10 μg/ml which was non-toxic. Cell migration as measured with filters coated with 7.5 μg/filter type IV collagen was reduced by only 25% suggesting that the cysteine proteinases played a more minor role in cell migration in the absence of a basement membrane barrier. On the other hand M-27 invasion was not significantly affected by treatment with E-64 even at concentrations as high as 100 μg/ml. The animals were killed 1 h after the injection and the cathepsin B and cathepsin L activities in the lysosomal were assayed. The inhibition caused by E-64 was already detectable 1 hour after its injection. Navab R, Mort J S, Brodt P. Inhibition of carcinoma cell invasion and liver metastases formation by the cysteine proteinase inhibitor E-64. Clinical & experimental metastasis, 1997, 15(2): 121-129. Hashida S, TOWATARI T, KOMINAMI E, et al. 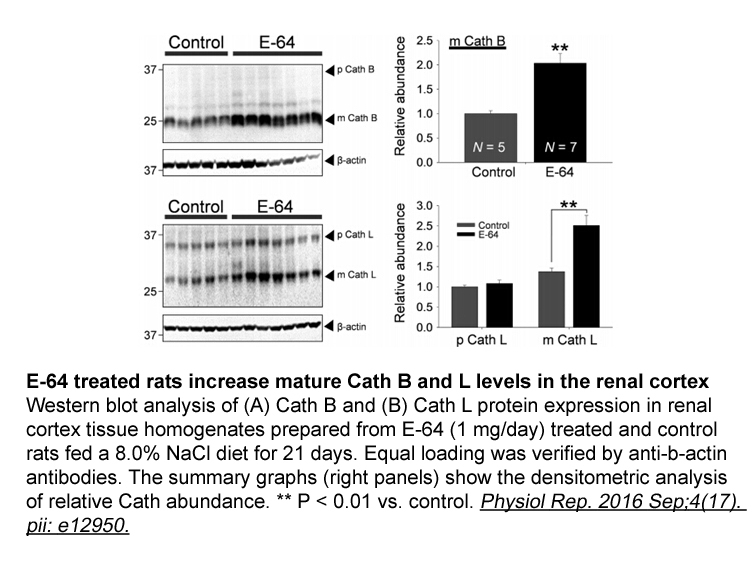 Inhibitions by E-64 derivatives of rat liver cathepsin B and cathepsin L in vitro and in vivo. Journal of biochemistry, 1980, 88(6): 1805-1811. 1. Conformational mobility of active and E-64-inhibited actinidin. Biochim Biophys Acta. 2013 Oct;1830(10):4790-9. doi: 10.1016/j.bbagen.2013.06.015. Epub 2013 Jun 23. 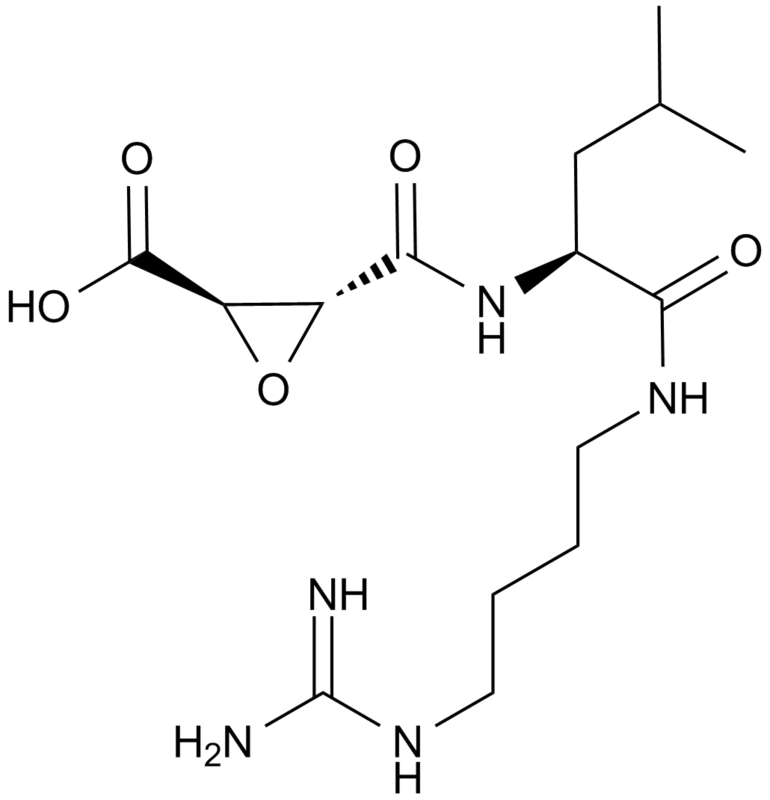 Actinidin, a member of C1 family cysteine proteases, has many advantages, including a wide pH activity and wide substrate specificity, which make it a good model system to study enzyme-substrate interations. 2. In vitro ANTIGIARDIAL ACTIVITY OF THE CYSTEINE PROTEASE INHIBITOR E-64. Rev Inst Med Trop Sao Paulo. 2014 Jan-Feb;56(1):43-7. doi: 10.1590/S0036-46652014000100006. 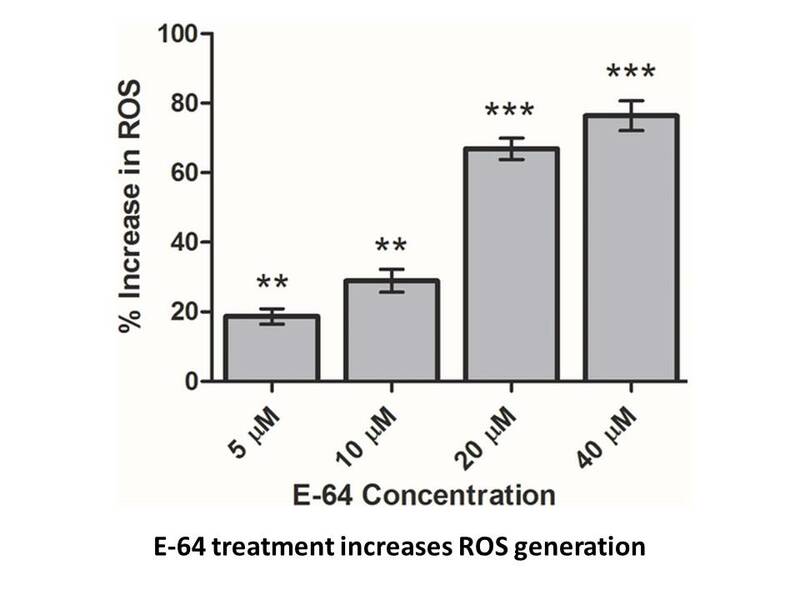 E-64, a cysteine protease inhibitor, decreased rates of Giardia trophozoites growth, adherence and viability by > 50% indicating it interferes in some crucial processes involved in parasite survival. E-64 not only promoted blastocyst development of SCNT embryos but also increased the cryosurvival rates of IVF and SCNT blastocysts. IVF and SCNT blastocysts derived from E-64-treated group were characterized by increased total cell numbers, decreased apoptotic nuclei, suppressed Bax expression and stimulated Bcl-xL expression. 4. The thiol proteinase inhibitor E-64-d ameliorates amyloid-β-induced reduction of sAPPα secretion by reversing ceramide-induced protein kinase C down-regulation in SH-SY5Y neuroblastoma cells. Biochem Biophys Res Commun. 2013 Nov 8;441(1):256-61. doi: 10.1016/j.bbrc.2013.10.045. Epub 2013 Oct 17. E-64-d, a calpain inhibitor capable of preventing PKC degradation, diminished Aβ-induced decrease of sAPPα secretion. 5. [Effect of different molarity cathepsins specific inhibitor E-64 on dentin-resin bonding durability]. Zhonghua Kou Qiang Yi Xue Za Zhi. 2013 Jun;48(6):368-71. 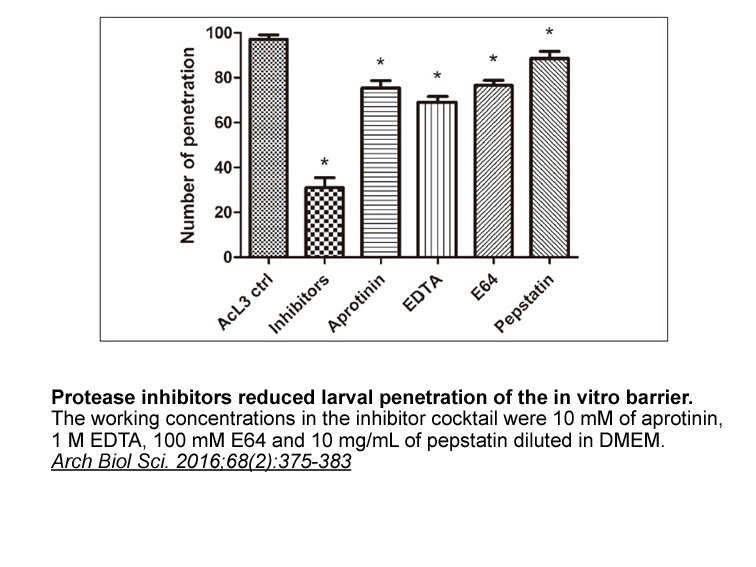 E-64, a cathepsin inhibitor, has been investigated for its in vitro effect on dental endogenous cathepsins and its most effective molarity to elevate dentin-resin bouding durability. A new class of compounds that show promise of acting as class-specific inhibitors for the cysteine proteinases are the L-trans-epoxysuccinylpeptides related to the compound E-64 [L-trans-epoxysuccinyl-L-leucylamido(4-guanidino)butanel , isolated from cultures of Aspergillus. E-64 was shown to inhibit papain, ficin and the fruit and stem bromelains, with disappearance of the thiol group of papain1. 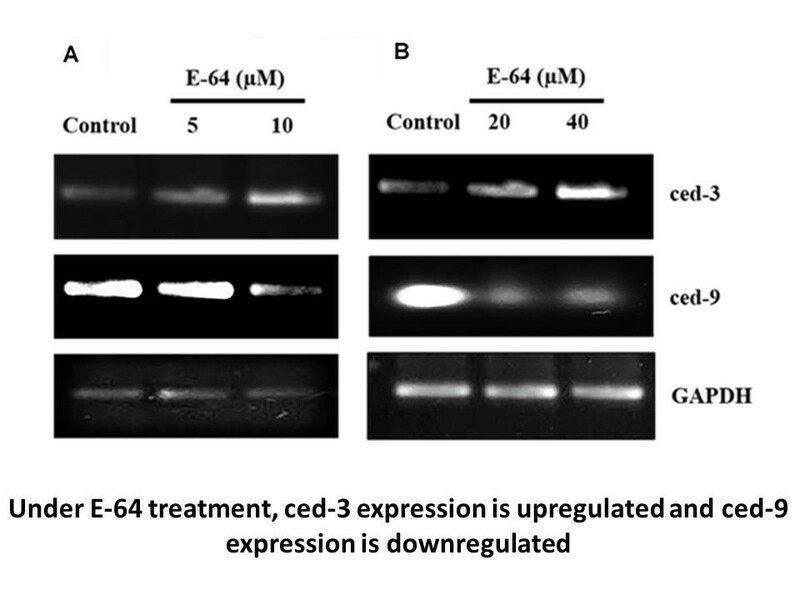 E-64 has been reported to inhibit two other mammalian cysteine proteinases: cathepsin L3 and a proteinase from human breast-tumour tissue4 and the calcium-dependent proteinase, calpain, from chicken muscle5. All of these characteristics suggested that E-64 might be a valuable inhibitor for the study of cysteine proteinases. Lineweaver-Burk plots of inhibition data show that the action of E-64 was not competitive with substrate1 . Moreover, the optical isomerism of the epoxysuccinyl moiety seemed to have no effect on the activity of E-64 as an inhibitor of papain6, 7 .If E-64 were indeed acting by covalent reaction at the active site, its rate of reaction would be decreased by the presence of leupeptin, a tight-binding reversible inhibitor8. E-64 inhibits only cysteine proteinases. Papain showed a particularly high reactivity with E-64, and good rates were also obtained with the other plant enzymes and the lysosomal cysteine proteinases. There is structural evidence that these enzymes form a homologous group9, and they resemble each other in having Mr about 25 000, no (detected) zymogens and no distinct requirement for calcium. Chicken skeletal-muscle calpain is reported to be inhibited by E-64, but the rate constant has not been determined5. The most obvious practical application of E-64 is in the active-site titration of the papain-related cysteine proteinases. Active-site titration as a method of determining enzyme concentration has the advantage over rate assays of being insensitive to reaction conditions, and giving a result in active-site molarity10 (Bender et al., 1966). 3. Towatari, T., Tanaka, K., Yoshikawa, D. & Katunuma, N. (1978).J. Biochem. (Tokyo) 84, 659-671. 4. Mort, J. S., Recklies, A. D. & Poole, A. R. (1980) Biochim. Biophys. Acta 614, 134-143. 6. Hanada, K., Tamai, M., Morimoto, S., Adachi, T.,Ohmura, S., Sawada, J. & Tanaka, I. (1978a) Agric. Biol. Chem. 42, 537-541.